So I had an epiphany today. I asked myself why I keep losing my feeling of a need to keep up and improve my quality of life - exercising, eating well, expressing my creativity, fulfilling my family obligations, etc. It's not that I want to and just don't. It's that I stop wanting to, and it's not like a feeling of complacency. The desire just goes. This cycle is something that has been very prevalent in my life the past few years, but I have never before had the state of mind to realize it and ask "why" at the same time. That is, until tonight. I realized that it's not a matter of desire; it's a matter of ability. I haven't had much schooling in Psychology but what I have had, I have loved and hung on to some things I've learned for a long time after I learned them. 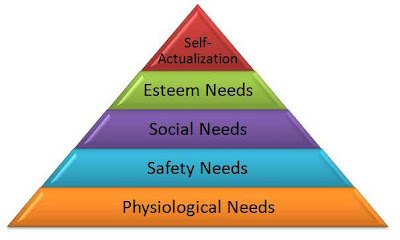 One of these is Maslows Hierarchy of Needs. The basis behind it is that you have to start at the bottom and you can't have a higher item without having all of the items below first. The highest level is ideal, but most people ebb and flow with where they are in the pyramid throughout their lives. Personally, I am happiest when I am at the tippy-top of the pyramid. Far too often though, I hover around step two. I have also found that when one aspect is at a certain level, the other aspects of life shortly decrease to the same level as the lowest aspect. For example, when I am working 14 hours a day for multiple days in a row just to keep afloat, my family life, my health, and my social life suffer - greatly and quickly. It's also keeps me from doing the things that make me happy. Any free time is spent sleeping mostly. My house almost looks the same as it did when we first got here. I don't have a refrigerator or washer and dryer yet. I have no idea what my family is up to. I haven't had time to write about my new environment, place, and life. I had a total of 3 showers last week - I KNOW! I could go on. I done with it. Extra money is not worth such a drastic, lowered quality of life. I need to get back to me, and in doing so, make my life and those around me better off. I have so much more to give than this. Stay tuned for how I take it back.